Greenwich Academy summer programs encourage boys and girls to imagine, discover, and create. 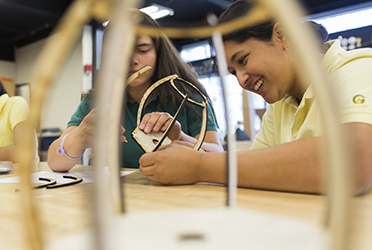 Classes, taught by GA’s experienced teachers and coaches on our 39-acre campus, include engineering and design workshops, debate camp, chess, athletics, language studies, drama, and a variety of creative art experiences. Weeklong sessions are open to children entering pre-K–12 for full or half days in the month of June. Summer at Greenwich Academy sparks imagination, curiosity, exploration and creativity in a co-ed summer community. 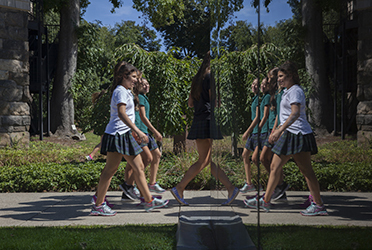 Girls and boys explore nearly every inch of our 39-acre campus. There are opportunities for Engineering and Design, debate, creative writing, language immersion, and new this year, classes for parents and caregivers. Classes are taught by our innovative and knowledgeable faculty and staff as well as outside vendors of the highest quality. The off-season is a perfect opportunity for girls and boys of all ages to get some extra playing time in a favorite sport—or try a new one. Greenwich Academy coaches and physical education instructors run fun and rigorous camps in a variety of sports, catering to all ages and levels of experience. Bringing the same enthusiasm and expertise that power GA’s school-year athletics, the faculty and staff focus on skills and sportsmanship. This weeklong session is taught by a variety of professional dancers/choreographers. Each class will feature a different style of dance, including jazz, hip hop, modern/contemporary, and Broadway. Following a 2-hour class, participants will have an opportunity to talk with instructors and seek advice for pursuing dance in the future. ESF offers a variety of day, sports, technology, and specialty summer programs for boys and girls ages 3–16. Full- and half-day options are available; weeklong sessions run for 9 weeks.